1979 Mustang - history,specs,performance and more. The 1979 Mustang was all new. Based on the Fox-4 platform, it shared some components from the Fairmont,Capri,and other Ford cars. Mustang enthusiasts often refer to this car series as a Fox Mustang or fox body Mustang. Compared with the previous Mustang 11 platform, which was based on the Ford Pinto, the lowest cost car in the Ford fleet, which made it's debut in 1970, the fox body cars fared much better. The platform was newer (1978) and the suspension, even in larger cars, such as the Fairmont, received positive reviews for it's road manners and stable rack and pinion steering when compared to many of it's domestic and European competition. Exterior styling of the 1979 Mustang clay mockup nears completion in May of 1976. Amazing how close the clay mock up is to the final 1979 pony car! To say the new Mustang was different from it's previous incarnation is a huge understatement. Many Mustang enthusiasts whose heart had left for greener pastures, began to take notice again of the new Fox Body Mustang. It was small but trim, looked powerful and seemed to represent more of what the original pony car had been designed to accomplish. Three different models were offered, in various trim levels. The Ghia option, which was available as a coupe (2 door) and as a hatchback (3 door) was as luxurious as ever and sported a distinctive Ghia insignia on the rear decklid or third door depending on configuration. The three door versions also has Ghia exclusive color keyed window frames, louvers and dual remote mirrors, bright belt and rocker panel moldings accented with pin stripes. The standard 1979 Mustangs were like the other offerings, available in a 2 door hardtop configuration or a 3 door hatchback which appeared externally to also be a coupe. 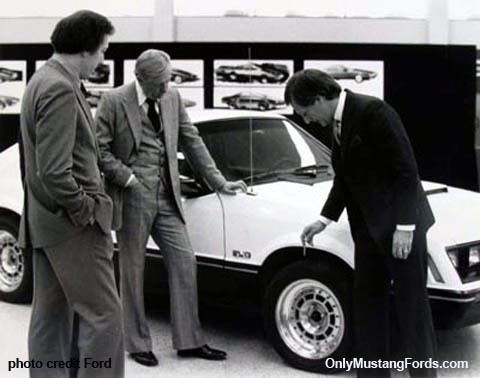 Although the new model had a 4.2 inch longer wheelbase and was both taller and longer overall than the 1978 Mustangs they replaced, they weighed 200 lbs less! Even though all but one engine choice was carried over from its previous life, they felt much more responsive, from the improved power to weight ratio. The 79 Ford Mustang had a longer nose. Smoother,less bulky sides and integrated bumpers, that made the old ones just look chunky were revealed. A hatchback was available for both, the standard and Ghia models and the lines were crisp, with a shopping cart saver rubber trim that ran from the front urethane bumper, all the way to the rear of the car. Gone was the mustang loge at the front of the grill and in its place was a small rectangular Ford script. Its roomier interior and sleeker styling took the world by storm and in fact, the amount of 1979 Mustang coupes, sold, were almost as many as the entire line of Mustangs that were sold the previous year! The change in the 1979 Mustang interior was not only well overdue, but impossible not to be redone due to the entirely new platform. The Ghia option, continued and was made available as a coupe and a hatchback and was as luxurious as ever. The very popular Indy Pace Car Replica came with its own special adjustable recaro seas and muted monochrome interior. A special edition Indy Pace car version, was well received by the public and was available with either the high output 2.3 liter turbo motor or the 5.0 liter V8. The original Pace cars used to Pace the cars in the Indy, were prepared by Roush with specially prepared 5.0 motors, which were needed to be able to pace the cars for the Indy 500 race. 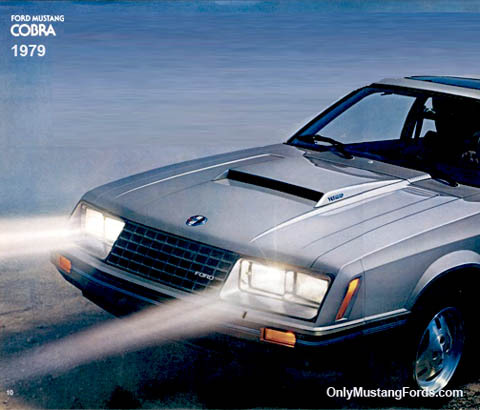 Ford produced just over 10,000 replicas, with over half of them including the popular turbo 4 cylinder. If you had another $1,200 bucks burning a hole in your pocket, you could order the Mustang Cobra option, which consisted of the powerful little 2.3 liter turbo 4 cylinder engine, making only slightly less power than the V8. a slick sport exhaust with chrome tips completed the look. And if you wanted the Mustang version of the Trans am screaming chicken, you could order your own hood decal for an additional $78 bux. The 1979 Cobra included the now familiar turbo hood scoop, aluminum wheels, blacked out lower bumper and side trim and rear quarter window louvers. The interior featured a sport upgrade including tachometer, and instrument cluster set. Ford sold a total of 17,579 of these Cobras and there were rumors of the 2.3 liter engine becoming the direct replacement for the venerable V8. Ford carried over the 2.3 liter inline four cylinder, with 88 horsepower. The 2.3 liter turbocharged inline four, with 132 horsepower. Plus a 2.8 liter V6 with 109 hp. The other performance option was again, the 5.0 Liter V8 pumping out 140 horsepower.